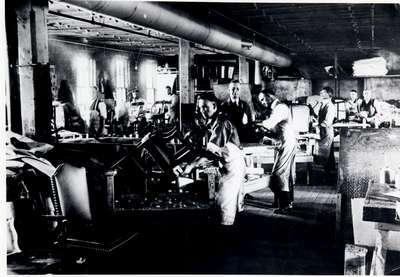 Black and white, interior photograph of H. Krug Furniture Company factory, showing unidentified workers assembling, finishing, and polishing furniture. The H. Krug Furniture Company was located at 111-113 Ahrens Street West, Kitchener, Ontario, according to the 1928-1929 Vernon's City of Kitchener directory. The negative of this image is in the Waterloo Historical Society collection. Please see P007079, P007081, P007082, and P007084 for H. Krug Furniture Company photographs.